The Age of Steam is the new series started by Devon Monk. This time she writes steam-punk (I wonder where they got the word steam-punk?). I don’t really understand why so many fantasy buffs don’t like steam-punk. It’s great fun along with most other fantasy. As Monk is the author, the quality of the book is guaranteed (thankfully). It’s light entertainment (a little heavier than the lightest) and doesn’t strive for moralistic or philosophical preaching. However, Monk does treat her characters as complex beings with dark and light sides. I abhor literature where the goodies are sugar-good and the baddies are black as tar bad. Way to go Monk. Dead Iron is the first installation in the series about the bounty hunter Cedar Hunt. Cedar has a “slight” health problem that becomes uncontrollable about once a month. To protect others, he lives a bit outside town. When a small boy goes missing, and the parents go to Cedar for help. After a lot of hesitation he takes on the case. During his search Cedar meets other strange people and a lot of prejudice and fear. 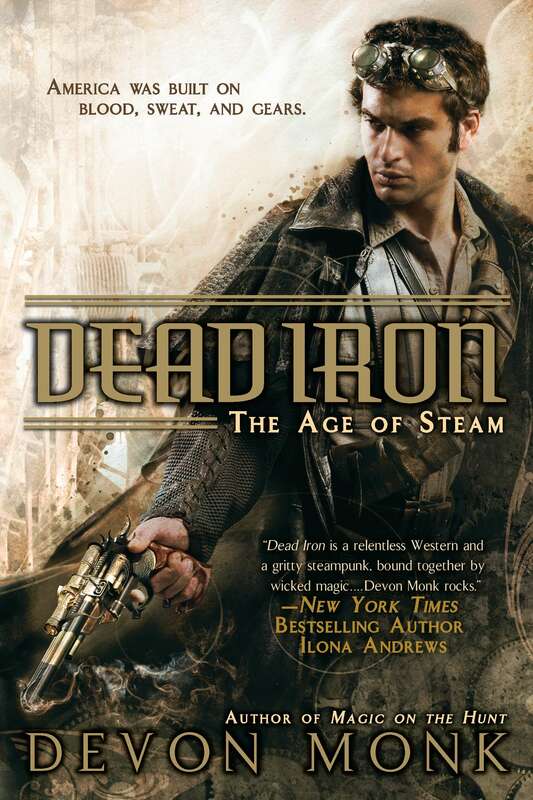 In Dead Iron, Monk combines fantasy and technology in a wild-west world where the impact of iron and technology threatens to destroy the presence of magic.